Magazines come and go, but some are more important than others. Newsweek is one of the important ones. Much of the attention since news broke that the magazine would cease publishing a print version has focused on the career of editor Tina Brown. But the title’s possible demise is also an appropriate moment to remember how significant the magazine itself is. When Time launched the first “news-magazine” in 1923, it was small and almost unknown—overshadowed by the Literary Digest, the Saturday Evening Post, and many others that withered away after many successful years. Ten years later, not only had Time become a successful magazine, but so had a new rival—News-week. It was launched by Thomas J.C. Martyn, a young man who came home from World War I having lost a leg in combat. Shortly after he returned, he came to work at Time. For a while, he was the highest-paid editor in the company. But when Henry Luce moved the magazine to Cleveland, bringing his editors with him, Martyn refused to go, partly because Luce would not reimburse him for the move. Martyn moved to the New York Times for a few years, until in 1933 he launched News-week (which soon dropped the hyphen). The editors at Time ridiculed the new magazine. “The first issue doesn’t frighten us,” they said. “Most of the writers were fired from Time for incompetence.” Some described the new magazine as “dull and stodgy.” But it wasn’t long before Martyn and his successors became a true rival to Time. In the dark years of Vietnam, Newsweek opposed the war almost from the beginning, while Time continued to support the war almost to the end. 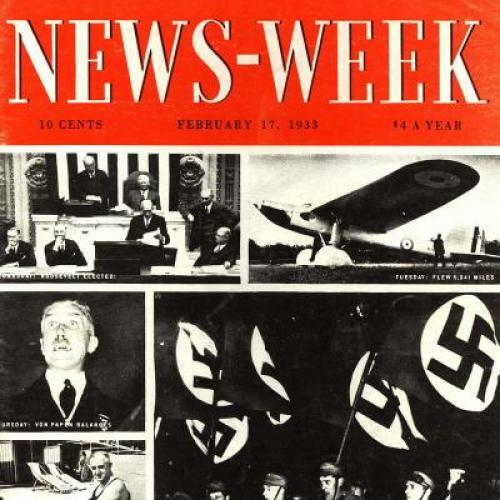 And for a time, it helped Newsweek draw a large circulation and to recruit some of the best reporters and writers for decades—among them Benjamin Bradlee, Richard Smith, Edward Kosner, Stewart Alsop, George Will, Meg Greenfield, Jack Kroll, Shana Alexander, Anna Quindlen, Jonathan Alter, Jon Meacham, and many others. But the good times began to deteriorate in the early years of the twenty-first century. It wasn’t the writers and reporters who weakened the magazine. It was Newsweek’s owner, the Washington Post, that began its demise. The Post itself was in financial trouble—just as many other periodicals and newspapers declined as information moved steadily into the Internet, leaving publications without enough advertising. And it has weakened, too, by the many readers who no longer look at traditional news and find it wherever they find it on the web. Both Time and Newsweek transformed themselves over the last years into magazines filled with opinion and a few large essays. Time has survived so far, in part because it is supported by one of the most powerful corporations in the America. Newsweek has no such support. Sidney Harman, who bought it from the Post for a dollar, generously kept it going in the last months of his life, but even his efforts has been unable to stem the deterioration. Newsweek might return and become an important digital magazine. But for now, the Newsweek we know appears to be gone with almost all its longtime reporters and writers moving into safer grounds. Whether Newsweek survives or not, the magazine has left a great legacy for everyone who has learned from this thoughtful, intelligent, and interesting publication that has helped millions of readers to learn about the life or our times. A professor of history at Columbia University, Alan Brinkley is the author of The Publisher: Henry Luce and His American Century.